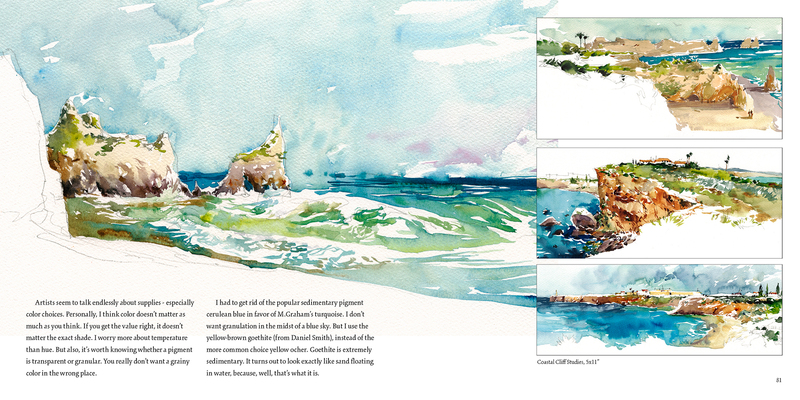 Announcing my new book ‘Direct Watercolor’- Available Now! This is a super-huge, major-mega announcement! I’m so excited to be able to say, my third book, Direct Watercolor <affiliate links, thx) is available now on Amazon stores worldwide! We have painted, written, designed and published this book, entirely ourselves. Due to various life-situations, some personal, and some professional, I won’t be teaching in person as much this year, and I won’t be able to release a new video class in the near future. This self-published book is my first major effort at self-sufficiency in our new circumstance. Direct Watercolor is a retrospective collection of over eighty of my watercolor paintings from the last five years. Most of them painted side-by-side with fellow urban sketchers as we gathered for our international urban sketchers symposia. 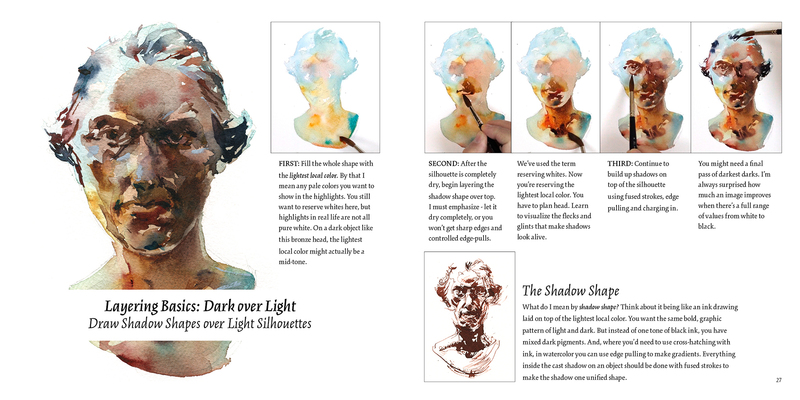 The book features my latest thinking on the technique of watercolor painting, with all new commentary on old favorites, as well as six completely new step-by-step demonstrations. 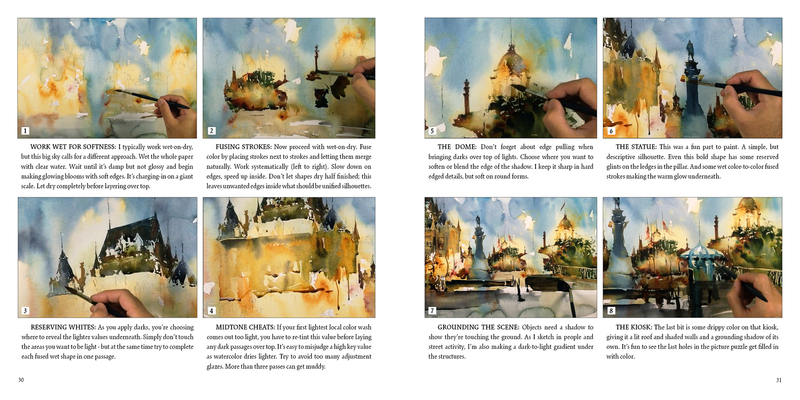 If you’ve been a reader of Citizen Sketcher, you’ll be familiar with my deceptively simple approach to spontaneous painting. 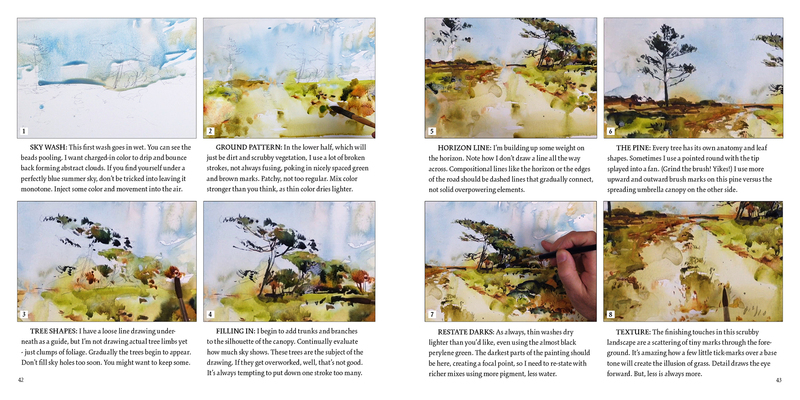 I hope these examples bring it all together into something helpful for beginners, and still interesting to experienced watercolorists. 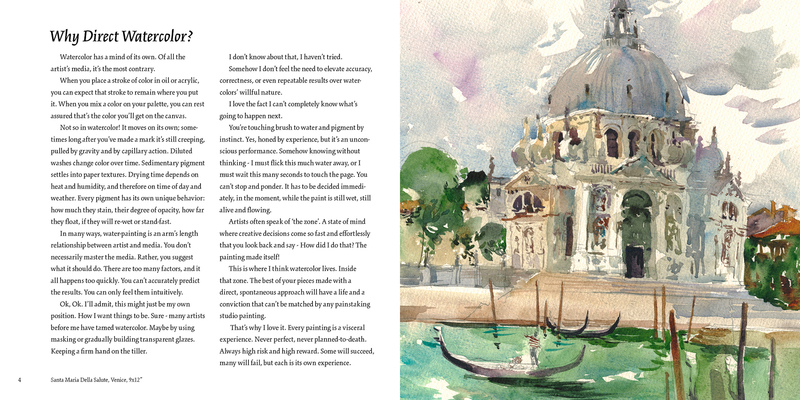 Direct Watercolor is my first independently published book and is printed and distributed through Amazon CreateSpace. As such, it is not available in bookstores at this time, only by online order. I still have a good relationship with my conventional publisher, so The Urban Sketcher and Designing Creatures and Characters will still be selling through traditional book-channels. It’s a big step releasing this new project on our own, but it has been an opportunity to make exactly the book I wanted, and I hope it will be the first of many to follow. But – we absolutely need your help to make it work! If you’d like to help, we are grateful for the assistance of every single Amazon review. It can be as little as giving a star rating, or just a sentence or two. Every person who takes the time to send a review improves the chances my book will appear in searches and recommendations. As well, thanks to everyone who’s helped out in the past with reviews, by coming to workshops, by supporting urbansketchers.org, and of course being one of our blog readers. You are what got us this far. It has been a wonderful journey, learning by doing and sharing the results with you. I hope to continue for years to come. ← Announcing: #OneWeek100People2018 starts Monday March 5! BRILLIANT! CONGRATULATIONS…i AM BUYING ONE! It took me all of 15 seconds to get it in my cart at Amazon and purchased! Can’t wait to get your new book and tell all my fellow sketchers about it. Oh yes, I remember finding you way up the garden staircase, painting that ornate and fabulously complicated manor house in Ireland. This looks beautiful, Marc! Huge congratulations. Thanks so much Mme. President! Congratulations Marc! This book looks great. I just ordered it. In advance I can say thank you for writing it! I wish you the very best Marc, wonderful spreads these are. Buying! So exciting! No hesitation, straight to Amazon.Thank you! Wow Marc, a «must-have» for me … thank you for your ideas and inspiration. Congratulations, Marc! I just bought a Kindle copy — and only a few pages into it, already I am blown away. Thank you for this gorgeous, inspiring master class not only in painting, but in *seeing* as well. Hi Marc! I’ve been painting for about four months, is your book suitable for beginners? 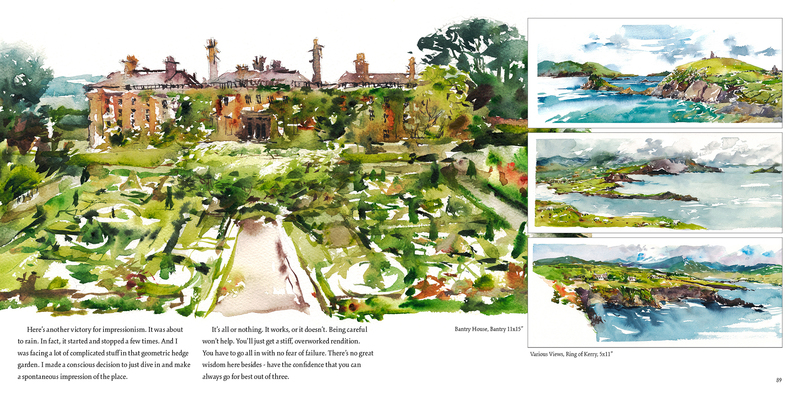 Also, what’s the difference between Direct Watercolor and Tea Milk Honey? I’m going to be honest an say Direct Watercolor is kind of the ‘advanced’ approach. T/M/H uses three layers in systematic passes. Direct is about doing as much as possible in a single statement. 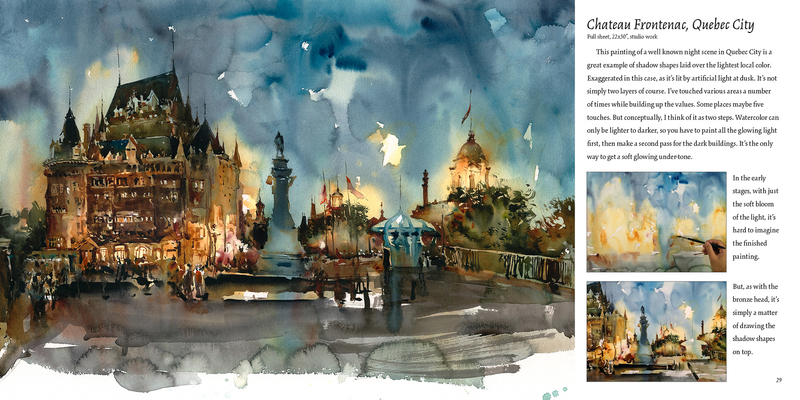 So yes – The Urban Sketcher is book one :) and/or my Craftsy Travel Sketching class. Still – if you’re a hard charger – you could jump to the head of the class :) But it would involve some struggle up front to master viscosity and brush control. I mean I’m gonna buy it anyway, I love your paintings. Thank you for the honest answer! I finished reading it — I love how strong your mixes are now! My favorite painting is in page 72, from Siem Reap. I love the tree on top of the temple. How much faster would you say this method is? 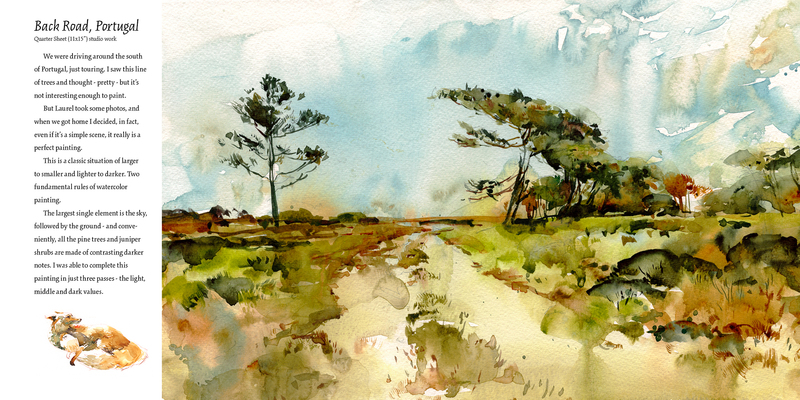 For a given painting, how long does it take with each of T/M/H and Direct Watercolor? I’d say I’m twice as fast as I once was, as I used I say, spend half the time on the drawing – plus there’s less waiting for things to dry. Not zero waiting, but a lot less. Bravo! and Congrats! I am so excited to see this book come out. Can’t wait to get my hands on it, so I can learn tricks from the master!!! I just downloaded the Kindle edition (couldn’t wait for a hard copy). I love your style. I’ve just got as far as the Basic Tips and I know I’m going to love it. Sorry to hear Charles – it’s really everywhere hey? Best of luck. Hi Marc, I am going to purchase it immediately after I leave this comment. I will promote the hell out of this book because you’re my hero and because your work brings me so much joy. I love your direct watercolor style. From the moment I saw it I’ve been obsessed. Thank you for putting it out into the world. I hope it sells well so you can create more indie books! Just ordered it and I’ll be sure to post a review!!! I bought it and am looking forward to learning form it. I’ve been through the Craftsy classes so many times I’ve lost count. Thanks for giving back to this community and raising up the new sprouts like myself!! Marc congratulations! Will add this lovely to my Taro-Holmes library. I just snagged mine on Amazon. Mahalo! Can’t wait to have it in these little urban sketching hands. straight to amazon for me, too! looking forward to it! Hey Marc, I purchased the Kindle version and just finished reading it. I loved it! On an iPad Pro it looks fantastic. The book reminded me how much I enjoy going straight to watercolors, so you’ve inspired me to do it more often from now on. Oh, and the night sketches… superb! Great job, congratulations! Congratulations on your latest effort. 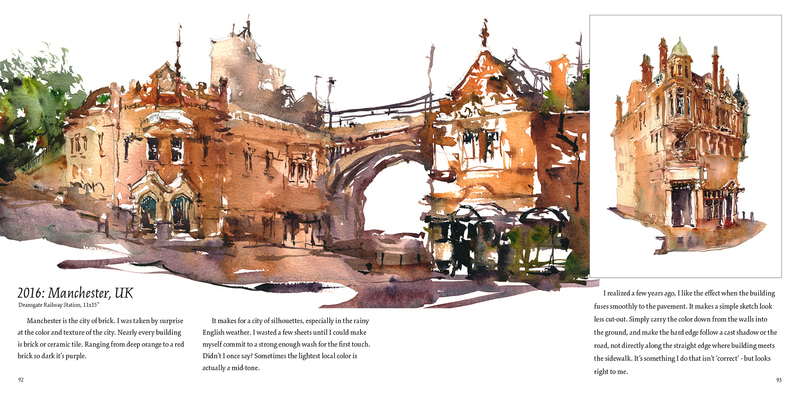 Marc I’ve followed you through your blog, your urban sketching, and have your book.. I enjoy it all… Best of luck .. you are a true artist. Wonderful news! Congratulations! Just bought it on Kindle! Great! Thanks Tony! Are you coming to Porto? Unusually simplistic, and aesthetically pleasing. Yay!! Just bought the kindle version. Interesting the price difference between Amazon Australia and US. My admiration to you for self publishing. Despite the financial outlay it’s nice to have total control over the content. I self published 20 years ago because I couldn’t find a publisher, but was lucky to have one pick it up later and re-publish o/seas plus a follow up. Even though I switched last year back to acrylic and mixed media, I have always loved your work and think you are a brilliant teacher. Sad to hear you have had personal setbacks and pray all will work out well for you. I went to Amazon and purchased the paperback copy to honor you and your great work, and hoping the color version does it justice. I have written 20 books and have 10 of them published through CreateSpace in black and white, even though their quality is inferior to my previous publisher’s. I have never tried their color process but the “look inside” section looks great. Hopefully you will sell like crazy. Noticed you’re already at the #1 position in search for the title. Best of wishes. Hahaha, maybe you’ll entice me back into watercolor again. Hi Marc, I bought the Kindle version yesterday and love what I’m seeing and reading. I still plan to buy the print version in the near future. Thanks for writing the book and sharing all the “goodness” and I wish you great success with it. Sketchers are going to lap it up. DRUMROLL! I ordered it yesterday, it will arrive tomorrow. So eager! I learned so much from the combination of your Craftsy videos and your Urban Sketching book, and can now hear your voice when I read your words. The videos really helped me to understand that it is okay to observe slowly, but not to paint slowly. That is, the speed of each brushstroke affects the character of each brushstroke. I knew it intellectually, but now I really know it, and it shows in my work. Thank you and best of luck with the coming year’s gifts and challenges. Way to go Marc ! Can’t wait to get my hands on it. Book just came. Glanced through it and love it already. Will start reading it later today. Your book arrived yesterday. I started devouring it, but then I really slowed down when I realized that I don’t want it to end! Now I’m savoring it; going slow. Thanks for writing a great book, Marc! Hi Marc. Writing from Sydney. I’ve been a rapt fan of your work and your teaching (Craftsy courses and your usk book previously). Of course Liz Steel loves to promote you, and I’ve done stuff both on-line and a workshop with her. The part of “Direct Watercolor” that gave me a moment of special enjoyment was (without quoting the full context): “Possibly this is a matter of getting older…..With age comes wisdom. Or something”. Brilliant. Congrats on the new book, Marc. I¹ve just placed an order for it, and look forward to enjoying and learning. PS ­ Thanks for the way you continue to share your insights via this newsletter. It¹s one that I always make the time to read. From: Citizen Sketcher Reply-To: Citizen Sketcher Date: Tuesday, February 20, 2018 at 11:13 AM To: Patricia Katz Subject: [New post] Announcing my new book Direct Watercolor¹- Available Now! Une version Française au format epub, serait super. Congratulations on your book. Can I purchase the book directly from you? Since I had a terrible experience with Amazon, I would rather not do business with them. Thanks. Hey Karla, can you mail me at marc(dot)taro(at)gmail(dot)com and we can discuss how to ship it to you? Love this book. Somehow the Kindle Store won’t let me open the book in a browser (works fine on my phone). Is it possible to tweak a setting to let me open the book on my much larger browser screen?